The index opened flat just above 8300 and went on to touch the highs of the day at 8326 only to be sold to lows at 8237, but some lower level buying saw the index close at 8277.55, still a small loss of 21.85 points. The broader market was also weak, with 597 advances to 938 declines. 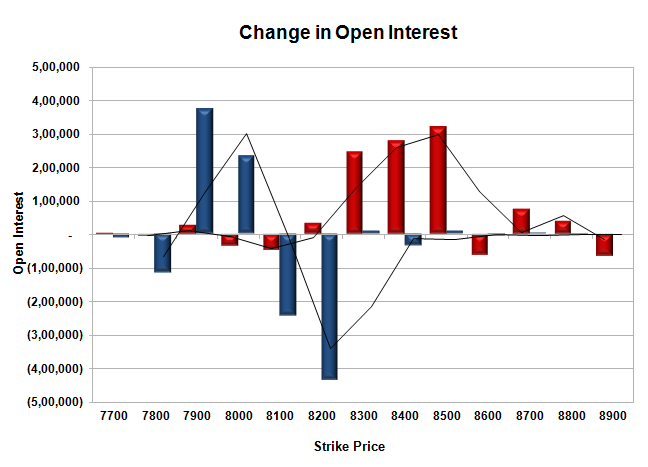 The Larger Range as per OI Table is 8000-8500. Call option 8300-8500 added 8.43 lacs OI with profit booking seen at 8600 and 8900 strike price. Put option 8000-7900 added huge 6.07 lacs OI with profit booking seen at 7800 and below strike prices. Nifty Open Interest is at 1,75,77,575 down by 4,06,175, with decrease in price, most probably long liquidation. 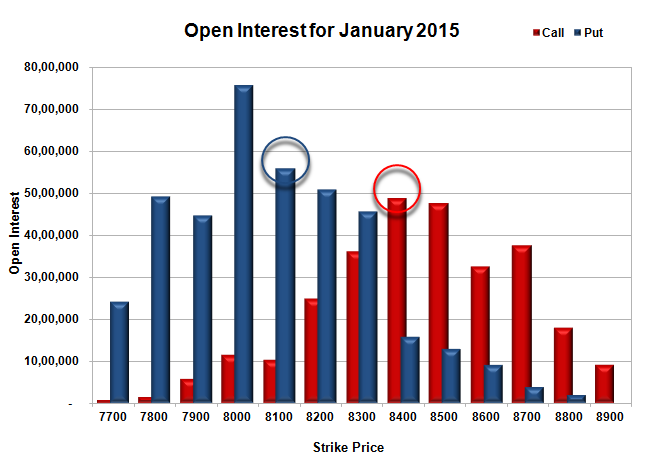 Bank Nifty Open Interest is at 21,93,225 up by 83,425, with decrease in price, most probably short build-up. FII’s bought 2.47 lacs Futures, which includes 4113 contracts long build-up and 5788 contracts short covering, with decrease in net OI by 1675 contracts (includes 68616 longs to 58715 shorts for the day) and the Average Price comes to 8640.05. FII’s Index future open contract as on date is 483624 Longs to 110319 Shorts, net long 373305 up by 9901 contracts. Initial support still at 8200, with huge OI of 51.01 lacs and below that at 8100 with huge OI of 55.97 lacs. Initial and best resistance at 8400, with OI of 48.81 lacs and above that at 8500 with OI of 47.50 lacs. 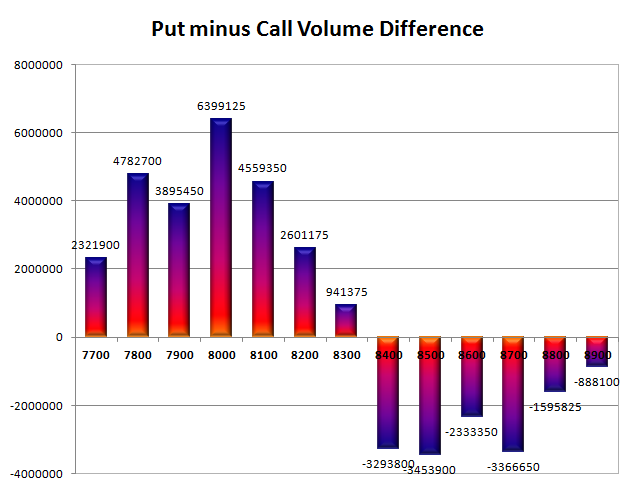 Day Range as per Option Table is 8204 - 8358 and as per VIX is 8203 - 8352 with 8280 as the Pivot.